BLACK STONE CHERRY is set to release their sixth studio album, Family Tree via Mascot Records/Mascot Label Group on 20th April 2018. "Burnin’", the first musical taste of the new collection is available today, along with the ability to pre-order the release in various physical and digital formats. Check out the lyric video for "Burnin’" below and pick up your digital version HERE. Physical album formats, including a UK exclusive clear vinyl option limited to just 1500 copies are available HERE. 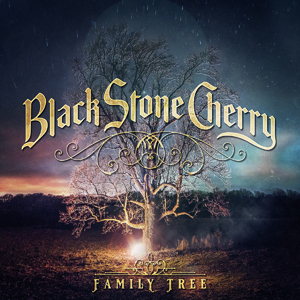 Family Tree boasts BSC’s tried-and-true lucky number with its 13 songs, and like all BSC releases, features songwriting contributions from each member. Drummer John Fred tells us, “Family Tree showcases all of our collective musical influences and how we have taken those to create something that is truly our own unique Southern American rock ‘n roll sound.” Two special guests appear, one bringing the concept of family full circle. Chris’ 5 yr old son contributes backup vocals on the swaggering "You Got The Blues", while the other, revered jam-band musician Warren Haynes (ALLMAN BROS/GOV'T MULE) offers a guitar cameo and vocals on the delta stomp of "Dancing In The Rain". The band first met Warren 17 years ago as freshly-signed youngsters on their first visit to New York City.